When the Leigh Historical Society were getting photographs and documents of the village ready for the Kent Archive website, a lady in Chiddingstone Causeway lent us a small note book. It had originally come from the late Dolly Lee (born Florence Hostler), who had lived for many years in Charcott and who died last year. However, it is not clear who the author was. The following notes taken from the usually one line, carefully dated entries, may help someone identify who wrote this “diary”. It is, however, clear that it was a man. An early entry in 1905 reads: “Went to Northfeet and stayed one night”. This seems unlikely to have been a lady. There is also the author’s own analysis of his bowling successes in 1904 and a note “I took 8 wickets for 3 runs against Leigh May 13th 1912, including a hat trick”. He also records that one “S. Burkett throwed a cricket ball 101 yards in Penshurst Aug 3rd 1908”. He was keen on national horse racing, boxing and football as well as the local cricket and football and he almost certainly lived in Chiddingstone Causeway (not least because of his cricketing prowess for them). He was clearly an adult in 1905 and almost certainly worked at Dukes cricket ball factory. In November 1905, for example he mentions “Mr W H Duke gave a big dinner to the employees at the Iron Room, aged 51 Birthday Party. 160 sat down”. There are also two entries about getting a new grindstone, which might well be connected with the trade. In particular, there is an entry “Ballmakers strikers visited us to get our firm out April 18 and 20, 1914. Our chaps came out 21 April and turned to work 13 May”. There are a large number of surnames mentioned which were (and sometimes still are) common in Leigh. As well as the Duke family, there were the Eades; the Coombers/Combers; the Days (“Larkins had a big fire – five stacks”); the Whibleys, Hills, Jenners, Crowhursts, Chandlers and Drapers; and also the Streatfield family of Chiddingstone Castle. There is a contrast between the local one line entries about the burial or marriages of village people and the brief reports of world or Kentish events – the sinking of the Titanic or a train crash at Tonbridge. However, several events cover both local and national. He saw the first airship that flew from France to London in 1910 for example. His description of his part in the First World War is laconic. “Joined the Royal Engineers Oct 1914. Came out 24th March 1919 with septic poison. Left Italy 17th Feb and arrived at Southampton 25th Feb. Went to Wimbledon to get demob. Started work 1st July. Peace celebrations 19th July 1919”. All through the ‘diary’, there are one line comments on the weather – floods, both local and national; local snowstorms (“20ft of snow drifts” at Christmas 1927); severe snow storm at the end of April 1908; and 1¾ inch hail stones on 25th May 1922. In June 1908 he records reading outside at 10 o’clock at night – clearly with no artificial light. There are a number of records of people emigrating to Australia and Canada but two entries which follow each other in 1908 leave much to the imagination. First, two Drapers go to New Zealand from Southborough, and then it is immediately followed by the phrase “Southboro Grave Scandal”. Another entry, which was clearly sad at the time, 1926, says “Mrs Glover, commonly known as Slappy May, fell out of a train near Penshurst Station instantly killed” . . . It seems as if the Church at The Causeway was finished in 1907 (is this true?) because the writer records the Bishop of Rochester consecrating the Churchyard on December 13th and what he says was the first burial in August 1909. In 1912 he mentions that he had dug a grave for Mr Everest although it is not clear whether he dug graves often. It might account for the great number of one line death announcements that he gives. In Leigh several families mentioned that their relatives had had to dig graves to make ends meet in the 1920’s and 1930’s. As the entries get fewer in the 1930s, the concentration on local deaths – always fairly frequent earlier – gets even more omnipresent. The notebook ends – in 1939 on the fifteenth small page – with nine names of the dead. “Uncle Cis Atkinson” was one. Perhaps the writer was an Atkinson? But can anyone in Leigh help identify him? In March and April 2003 the Historical Society Parish Magazine articles had the details of a local diarist in the early 1900s whose name we did not know. We now know who it was – thanks initially to Sue Featherstone who found the details of a famous Leigh cricket disaster in the archive of the local paper. 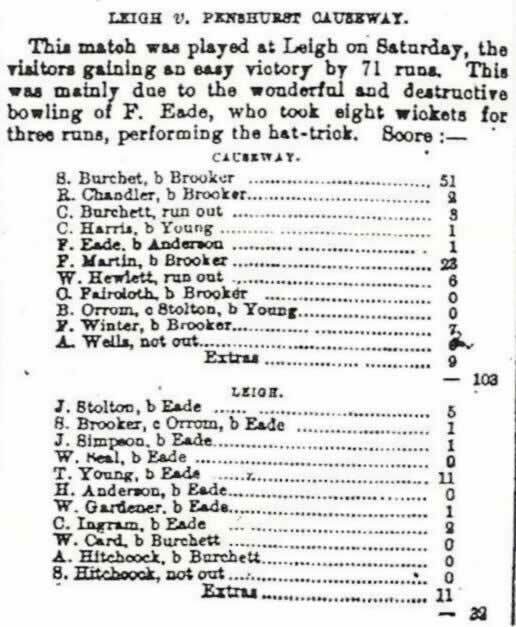 In the “Free Press” of 24 May 1912 the team known then as Penshurst Causeway made 109 with one of the well known Leigh Brooker family bowling five of the visitors out. However, disaster then struck Leigh. They were all out for twenty nine, thanks almost entirely to the “wonderful and destructive” bowing of F. Eade who took eight wickets for three runs, including a hat trick. So the previously unknown writer is clearly F. Eade who talks about the event in his own laconic way in the diary. On asking Graham Eade (our Special Constable) whether F. Eade was a relative, he referred us to his father, Les. Both confirmed that the man was Les’s Uncle Fred. The original articles thought that the writer was a cricket ball maker. Les says this is wrong. Fred was a bat-maker. The grinding stone mentioned was not a small one used for sharpening ball making tools but rather a large one which helped sharpen the bat-makers’ very different tools – spoke shaves, draw knives, chisels and various large and small blades. Les still has a collection which is very rare nowadays. Uncle Fred was a very short man but a fine cricketer and around 1902 he had a trial for Kent (Les still has a ball from that time). Although he did not quite make the Kent team, he loved the game and, as the diary showed, he was outstanding at village level. Fred’s diary also talks about a cricket ball makers’ strike in 1914. Les says that Uncle Fred was not part of it: “The bat-maker did not belong to the union”. Les says that they were more a law unto themselves. The strike was not successful anyway: they had to go back. Fred Eade served in the First World War but what the diary did not say is that he lost the first joint of his thumb, which made playing cricket difficult. However, by this time he was becoming less well although he went back to his trade – bat-making. As he became older, Les Eade, who had done his three year bat making apprenticeship with his father, Cecil, just before the Second World War, took over Uncle Fred’s job. Uncle Fred was married at 60 to a lady he had known for many years – just after the diary ends in 1938 – and he died in 1948.